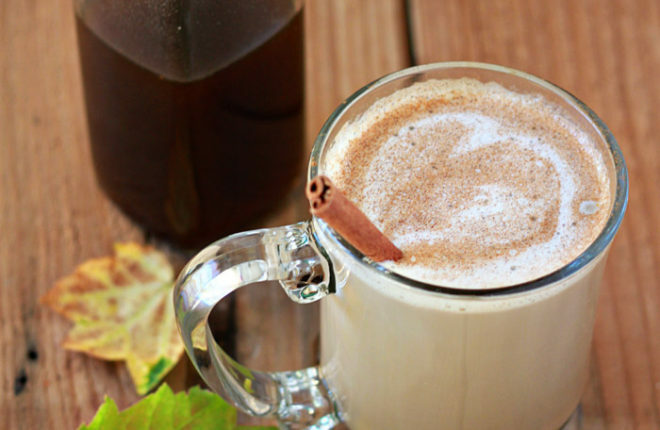 No weird colorings or preservatives – just pure, healthy, whole-food goodness in this homemade pumpkin spice coffee syrup. Brew some up over the weekend for pumpkin spice goodness all week long! It’s not called “fall” anymore, or “autumn” either. It’s Pumpkin Spice Latte season. Surely you’ve noticed it too? That familiar cozy smell wafts about as morning commuters dash out of drive-thru lines and run-walk on sidewalks, all slightly desperately clutching those familiar white coffee cups. 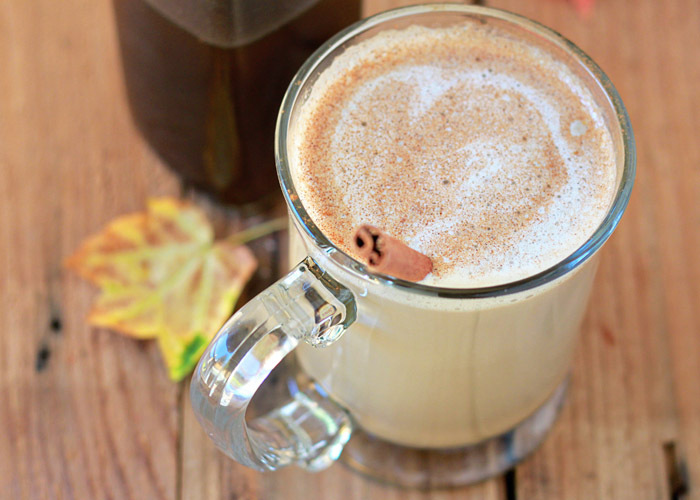 PSL – a must for the season’s morning wake-up. Cue downtrodden trombone tones. Have you seen the latest claims that Starbucks’ Pumpkin Spice Lattes are not as pure as the driven snow? Reports like these can come across as alarmist and because of that, they’re easy to dismiss. But on the other hand, it is another reminder that there’s a lot of really weird non-food stuff that goes into store-bought foods and drinks. 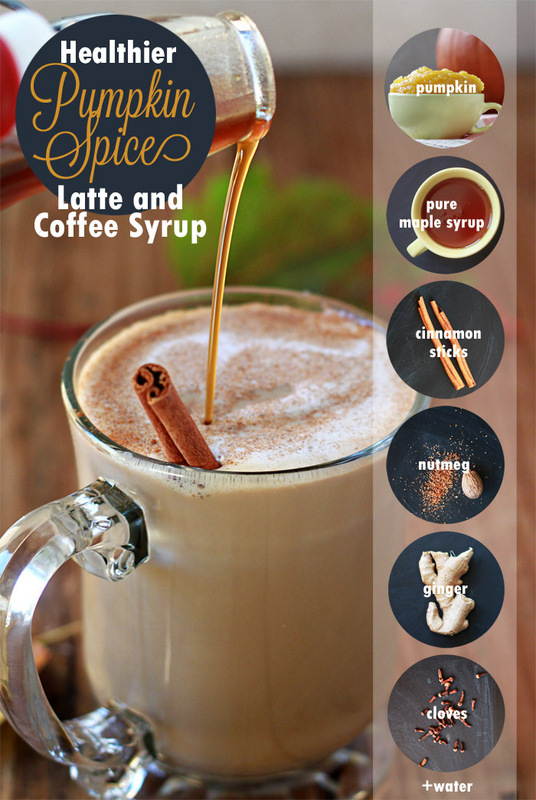 And if you can make the same thing at home – sans the caramel coloring or preservatives – then why not go that route? 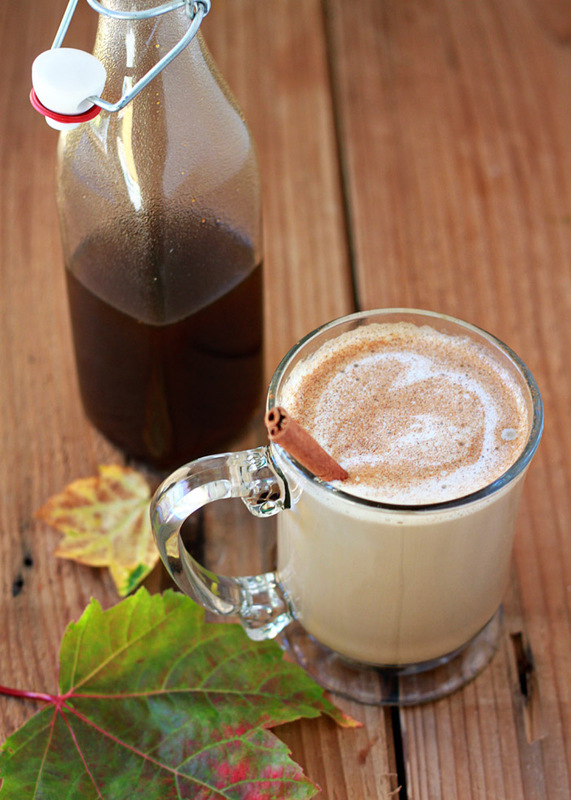 I’ve made pumpkin spice coffee syrup before, but in my effort to leave granulated sugar out of my diet, I wanted to challenge myself to create a healthier homemade pumpkin spice latte and coffee syrup. A little more pumpkin, a nub of fresh ginger, and pure maple syrup all the way, baby. Never going back. Unless I find myself at Starbucks and can’t resist. Because hello, I’m human. Otherwise, this stuff is so easy to whip up that there’s no earthly reason not to brew a batch on Sunday to keep in the fridge for PSL nirvana every morning of the week. Add it to straight-up coffee, or whip up a makeshift latte: brew up some super-strong coffee and fill your mug half full. Stir in some pumpkin spice coffee syrup. Now, pour some milk in a mug and heat it up. Place a whisk in the mug and put the handle between your flat palms, and then spin the dickens out of that thing! Before you know it: foam! Pour in the hot milk and spoon a little foam on top. Taste and add a little more syrup until it’s perfect. Who needs Starbucks? Okay, me. But maybe not nearly as often. Add all ingredients to a small saucepan over medium-high heat. Cook, stirring occasionally, until the mixture begins to boil. Reduce heat to medium-low and simmer for 10 minutes. Remove from heat and let sit for another 10 minutes. Place a fine-mesh sieve over a bowl or large jar and strain syrup. Discard solids. Pour into an airtight storage container and transfer to refrigerator. Contents may settle, so just give it a quick shake before enjoying pumpkin spice deliciousness in your morning coffee or latte. I like 2-3 tablespoons of syrup stirred in to each cup, but you may prefer more or less. Make it your own! Thanks so much, Sam! And thanks for the invite to join in your Fitness Friday link-up. Done! LOVE this healthier version. Thanks for sharing, definitely bookmarking this one to try soon. Karen, this is wonderful! I cant wait to try it. 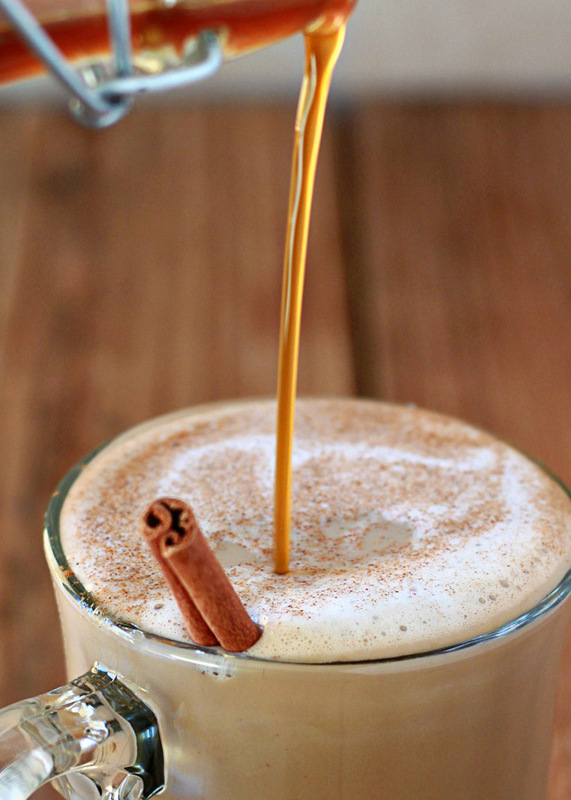 I gave up coffee syrups a long time ago and haven’t looked back, but I often craved a good pumpkin latte anyway. Now I can make them at home! YaY! Thank you! This sounds so delicious! 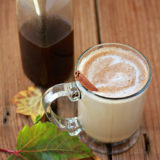 I was already thinking of making a Chai Latte for myself, but maybe a pumpkin spice latte is a waayyy better idea.. Actually I could think of a million uses for a syrup like this. How many reasons do I have left not to make it? Exactly. Can’t wait to try! How long do you think it will stay fresh in the fridge? I’m finding it’s about 5 days. And get this! I actually froze a batch a couple of weeks ago, defrosted it yesterday, and used it in my coffee this morning – totally perfect! Made this tonight and tried for the first time with almond milk. There is a special place in pumpkin spice heaven for you. Thank you! Ha – that sounds like my kind of afterlife! 😉 So glad you like it. Made this last night, and it only produced 1 cup after straining. I did substitute dark brown sugar for the maple syrup, because maple syrup is SO darn expensive! Do you think that’s why? Yes, brown sugar would mostly dissolve instead of contributing to the volume like maple syrup does. Good catch! I’ve amended the recipe to reflect that brown sugar may not produce quite as much, and I apologize that it wasn’t clear. I’m realizing I overestimated the total volume initially, too. I originally stated 2 1/2 cups but it’s actually more like two cups, and possibly less if you end up cooking it longer, etc. I absolutely love your websites!! Found this one during a search for Iced Coffee and have been perusing it for about an hour so far. I usually use agave to sweeten my morning coffee. Do you think that would sub for the syrup? Would it be ok if I used ground cinnamon, cloves, and ginger? I realize I’m late to the game to find this, but I’ve tried it out and like the results in general. If anyone’s paying attention to it any more though, My syrup seems to come out thinner than I thought and I’m not getting as much as you said. I’m curious if you could give some reference point for how thick/viscous it should be? My strainer keeps getting jammed up while straining too, is it possible I’m using too dense a mesh contributing to this? Thanks! How long can this be stored for in the refrigerator?